1) What is your role in the voyage? I am an Assistant Professor of Marine Science from the Virginia Institute of Marine Science - William & Mary. I will be one of the scientists helping to lead the research program on the cruise. My responsibilities include leading the study of the physical oceanography along the Northwest Passage, teaching the students how to make oceanographic measurements, and working with them to collect important data about the physical properties of the water masses. As part of the research program I will also be deploying an underwater robot called a Slocum glider to conduct autonomous studies in the Northwest Passage concurrent with the ship's cruise. 2) What is your background studying climate change and the Arctic? I first started studying the Arctic when I was postdoctoral researcher at the Woods Hole Oceanographic Institution. Using shipboard data collected in the Chukchi and Beaufort Seas, I investigated how water from the Pacific Ocean is transported in the Arctic Ocean. The input of Pacific waters into the western Arctic controls the stratification and heat budget in the upper ocean. The study helps us to better understand how oceanic heat transport can affect surface sea ice melt. I am currently part of an interdisciplinary study of the marine ecosystem in the eastern Beaufort Sea near the Mackenzie River, one of the largest rivers in the Arctic. I want to understand how physical processes such as wind, river discharge, and frontal dynamics drive river-shelf-basin interaction. I use an underwater glider to make the high resolution measurements needed for the study. 3) What are you most looking forward to about the trip? I have wanted to sail through the Northwest Passage on a sailing vessel for a long long time, so this is a dream come true. This expedition combines the rich nautical heritage and history of the Northwest Passage using a sail powered vessel with the tools of modern oceanography. I'm most looking forward to sharing the journey of exploration and research, and the Arctic's amazing natural beauty with all the students. 4) Have you sailed on a tall ship? 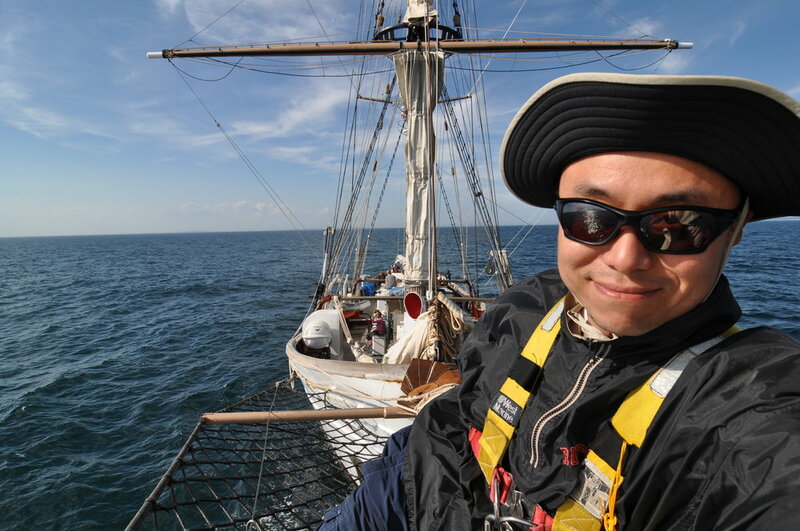 I have once sailed on the SSV Corwith Cramer with the Sea Education Association! It was an amazing experience that opened my eyes to another way of doing ocean research. 5) What special equipment are you bringing? I will be bringing two unmanned systems. The first is a Slocum glider named 'Sylvia'. This is an underwater robot that glides up and down the water column using a buoyancy engine. As it glides, the wings on its side push it forward. The glider doesn't go very fast but it can go far. It can stay at sea months at a time making measurements 24x7. It doesn't get tired (usually), and it doesn't mind rough seas. However, sea ice will still be a challenge for her and we will try to stay away from sea ice. The glider calls home once very few hours to update us on its position and upload data. I will also bring an aerial drone for aerial surveys of shorelines, study sites, and sea ice if we encounter them. 6) Do you have any predictions on what you might find? I anticipate that we will find stratified water column inside the Northwest Passage with a layer of sea ice melt water near the surface. Near the coast on both sides of the channel, we might find signs of a boundary current with flow velocities higher than the interior. The water column is expected to be highly productive this time of the year with abundance of light and nutrients so the ship's acoustic sensors should see plenty of zooplankton and fish and the glider's fluorometer should light up with phytoplanktons. 7) Why is it so important to study climate change in the Arctic? The Arctic is the region on Earth currently experiencing the fastest warming and changes in water chemistry. The reduction in sea ice cover will profoundly impact the Earth's radiative balance. The melting of Greenland ice sheet will contribute significant sea level rise that can inundate many coastal cities. Ocean acidification puts the entire Arctic foodweb at risk. The rate of change challenges even the most adaptable of organisms. Furthermore, Arctic climate is closely coupled with the global climate. With the prediction that by mid 21st century that the summer Arctic will be ice free, we are rapidly entering a new climate regime where not only people and organisms living in the Arctic will be affected but most of humanity will also be affected. It is crucial that we understand how the Arctic is changing now so that we can best predict and prepare for the future. 8) What outcomes from the project do you hope will help with the long term solution to climate change? I hope this project will help raise the awareness the Arctic requires today. Our actions today will determine the fate of the Arctic Ocean and its ecosystem. There is still time to limit the most damaging effects of anthropogenic green house gas emission on the Arctic's ecosystem; however, our time is very limited and we need to change our course soon. I hope the expedition will help inspire young people and a new generation of scientists to think globally and work together toward a brighter future.